It was past time I found some extracurricular activities, and with Tom Ross right next to the unclimbed-by-me Darwin and Mendel, the choice seemed obvious. The traverse between them supposedly goes at 5.8, so I would have to drop down from the ridge, but that only adds a little vertical compared to the climb over Lamarck Col. Among the unusually large crowd at North Lake, I was surprised to see a friend’s sister, Ephrat, who I did not expect to see until later in the Challenge. She proved both fast and sociable, and we hiked together and talked until just below the Lamarck Col switchbacks. I found myself alone at this point and, foreseeing a long day, turned on the gas and pulled away on the climb, reaching the col in just over 2 hours. 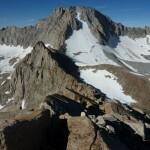 I dropped down to a sandy bench, then traversed to the ridge between Lamarck Col and “Tom Ross”. Staying somewhat close to the ridge, I enjoyed some interesting class 3 from the low point, and nice slabs near the summit, but also quite a bit of plain old boulder scrambling in between. 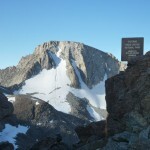 I reached the summit about 3 hours from the trailhead. 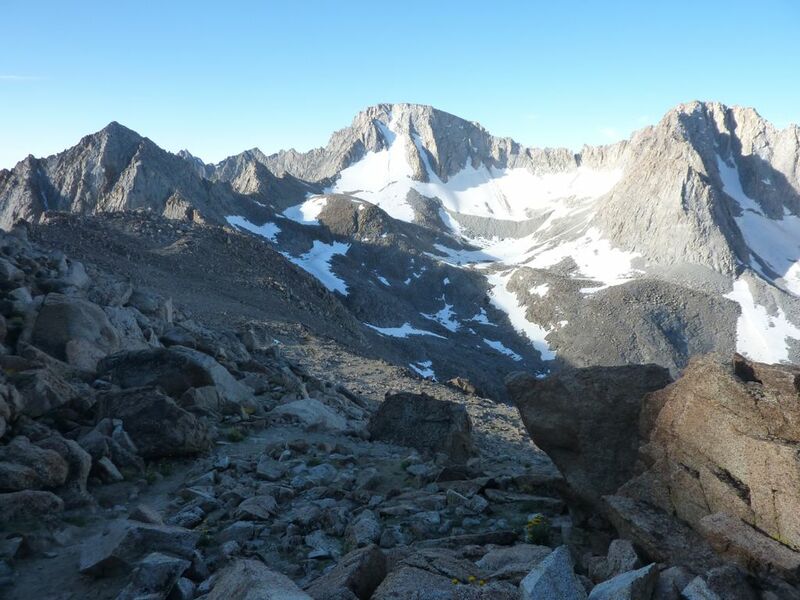 There was no pen to sign the register, so I had a snack and watched Bob cross a snowfield on the ridge before heading down the south ridge toward the saddle with Darwin. I thought I remembered it being class 2-3 in Secor, but the ridge quickly turned complicated. The sides are steep enough that it can be difficult to get on or off the top, and the top has some difficult steps and giant boulders. I eventually found myself well down the Sabrina side of the ridge, but I fortunately managed to find class 3-4 cracks back to near the low point. I wasted quite a bit of time, but at least I didn’t have to backtrack. I looked at Darwin’s northeast ridge, but knowing that it went class 5 at some point, and not liking the prospect of dodging onto a possibly-snowy face, I opted for the safe class 3 north rib/face. The snowfields had not begun to soften up, but fortunately those on Darwin’s north side were covered in enough suncups and crunchy surface snow that I could (barely) kick steps. The ridge had some loose stuff, but was mostly fun and sustained climbing. 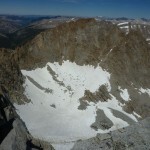 The snow couloir to its left was in perfect condition, but my axe and crampons were back in the car. Popping out on the huge summit plateau, the detached summit pillar was immediately obvious. 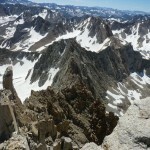 I was apprehensive after reading Bob’s trip report, but the route was fairly obvious and not that hard. 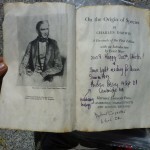 In place of a register, I found a copy of Darwin’s Origin of Species, and again no pen. 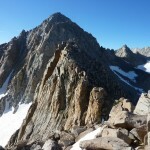 I sat for a minute admiring the savage ridge of the Evolution Traverse to the southeast, then headed back to the summit plateau and down the west ridge. Here began the cairn infestation. 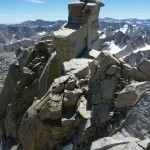 I normally like seeing cairns: not only are they reassuring, but they are a sign of one hiker helping others. In this case, however, they were absurd. 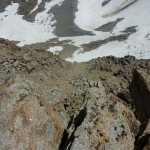 The west ridge is not that wide, and route-finding is trivial: if things get too hard, head down one side a bit. There is supposedly some 5.8 between Darwin and Mendel, but the stretch down to the notch was all tame and fun. After dropping down rocks next to the snow-filled notch, a bit of work with a stone ice axe got me to the start of the route on Mendel’s east face. 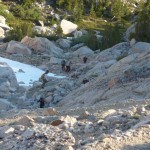 Here the cairns were useful, as one has to traverse on the right ledges in a couple of places. However, the climb was mostly unpleasant sand and scree. Frustrated, I ignored the cairns and headed straight for the northeast ridge near the top, and was rewarded with a bit of solid class 3-4 that dropped me right on the summit at 12:45, 6h45 after starting. From the base of the face, the snow was not as hideously suncupped as elsewhere, and a bit of boot-skiing cheered me up for the climb back to Lamarck Col. 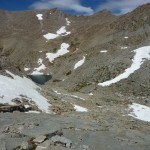 The south side of the col is much shorter than the north, and climbs almost as much grass as sand, a pleasant surprise. 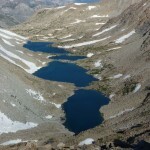 Passing over the col, I met two guys who recognized Yours Truly relaxing at the tarn. 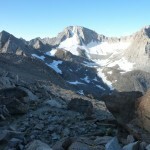 They were debating whether to climb nearby Mount Lamarck, and though I tried to be encouraging, my lack of enthusiasm for such an uninspiring mountain was clear. 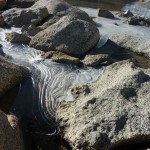 Waving goodbye (and, as usual, forgetting to ask their names), I took off at a run across the sand and boulders. Lamarck Col is an awesome run: while many sections demand concentration, most can be taken at full speed. I raced by a number of other Challengers on the way to the parking lot, music blasting, and arrived in 9h25, far less than the 12h+ I had expected. The beard was a very effective disguise. If you didn’t head up Lamarck, you didn’t miss much.